What types of mushrooms grow on trees? They go by many names such as polypore mushrooms, bracket mushrooms or shelf mushrooms. Generally the group gets categorized into the larger mushroom order Polyporales. Knowing a little bit about basic shelf mushroom identification fills a variety of utilitarian purposes. Some, but not many species, are edible. The presence of most, but not all species, is indicitave of poor tree health. From a practical point of view, when found on dead trees or stumps, their role as tree decomposes provides ecological utility to the forest environment. On the other hand, their discovery on an otherwise healthy backyard tree could indicate disease and subsequent demise of the tree. Finally, because they can be found year round growing on trees and stumps, they can rightfully be considered a mushroom enthusiast’s friend, for being present when many other mushrooms might be out of season. With hundreds of different species, identification can be challenging. Three identification tips can help start the process. Physical Appearance: Tough exteriors define the group. Physical traits such as top color patterns and shapes to bottom spore patterns begin the identification process. Spore Test: Note the spore color. Host Tree: Polypores can be single species or family host related or multiple family and host related. Of course, many mushroom enthusiasts use picttures to help identify the specimens they see on the trail. Here’s a dozen pictures and descriptions of about one dozen types of shelf mushrooms to help contribute to the conversation. Caveats always apply. Never consumer mushrooms based soley on picture identifications. Consider the mushroom in the picture. It is a multiple shelf mushroom so to speak. It’s on a Maple tree. A close up view of the underside of the mushrooms would show small tooth-like projections. Those identification clues point to the Northern Tooth Fungus. They grow predominantly on maple trees and birch trees. Seeing one means the tree is already endangered. Northern Tooth Fungus are great at decomposing the heart wood, or live wood at the center of the tree. Knowing trees also helps with the identification of the Birch Polypore. It is a common species in the Northern Hemisphere. 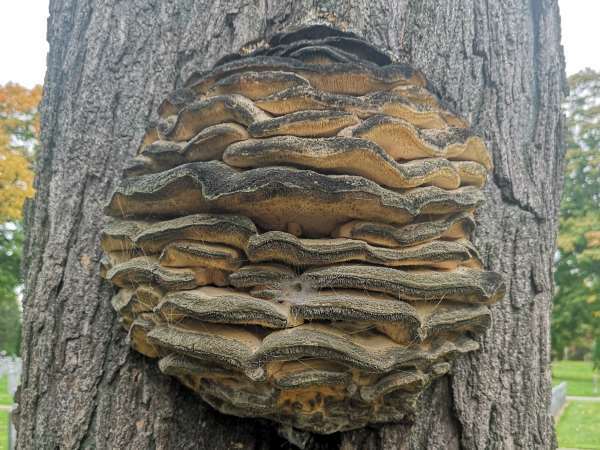 Fortunately for homeowners, it is mostly found on dead trees. 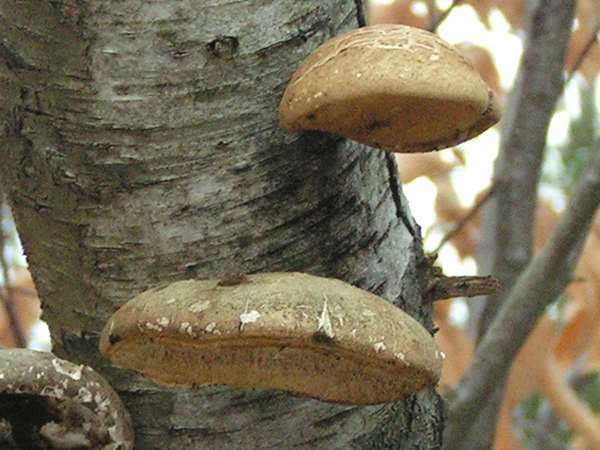 The leather-like mushromn is rounded and tan to light brown in color. The next picture potentially shows the Red-belted Polypore (Fomitopis pinicola). It belongs to the same genera as the Birch Polypore, albeit it can be found growing on a variety of both hard wood and soft wood trees across North America. Its white rim with red belt make it stand out. 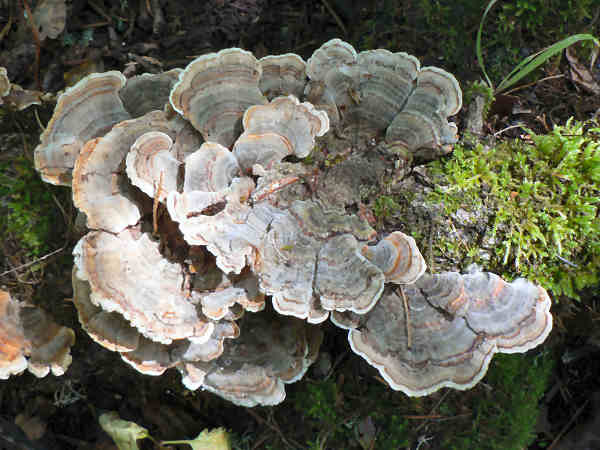 Turkey Tails (trametes versicolor) rank as one of the most common polypores in forest areas around the world. Its wide distribution makes it an easy find for mushroom enthusiasts more interested in finding culinary fungi than documenting local polypores. Long used as an immune system supplement in folk medicine, the FDA recently funded research into the Turkey Tail’s ability to boost the immune system during cancer treatments. 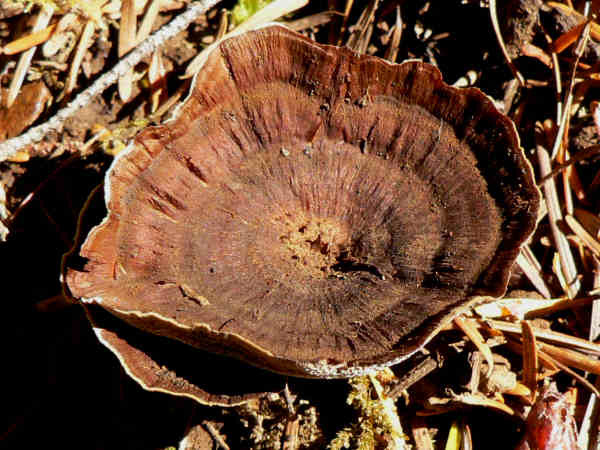 Dyer’s Bracket, the common name given to the mushroom, Phaeolus schweinitzii, also fits into the family Polyporaceae. 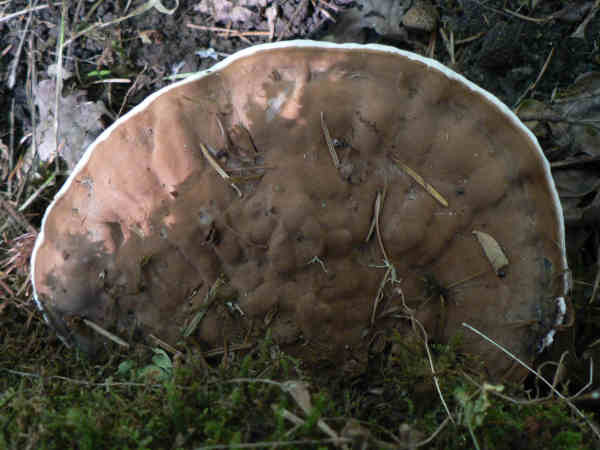 A thick mushroom with a soft fuzzy texture on the top, along with pores on the bottom, it typically grows on the ground (on the root system) with the occasional specimen growing as brackets on the trunk of the tree. The mushroom in the picture measured approximately nine inches in diameter, making them easy to spot walking through coniferous forests. Dyer’s bracket comes in a variety of colors that can be used for dying yarn, explaining the common name. Trees spotted with dyer’s bracket need to be monitored. The mushroom naturally decomposes wood, eating away at the roots or trunk, eventually killing the tree or making it easier for the tree to be felled by wind. Color separated the Cinnabar Red Polypore from most other common shelf mushrooms. 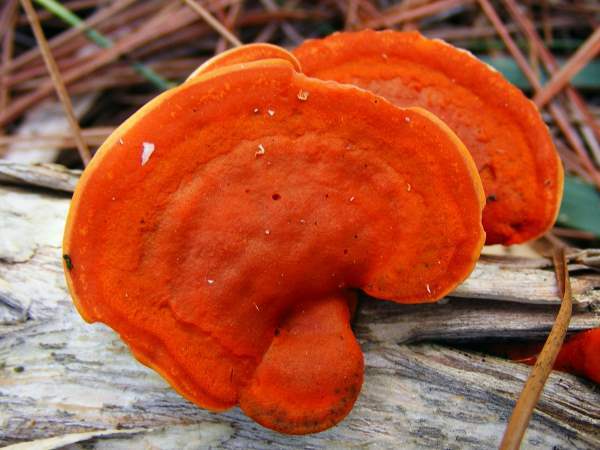 Young specimens have a striking cinnamon to red to orange color that fades over time. Look for them on a variety of dead trees and stumps. 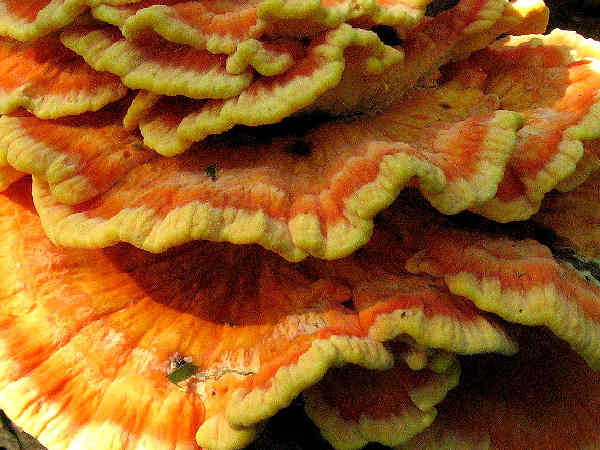 Newer specimens of Sulphur Shelf or Chicken of the Woods mushrooms are also easy to identify. They have a striking circle of colors on the top. They also grow in bunches, perfect for the mushroom pickers looking for a meal. They are often associated with oak trees. Finding one on a living oak often means the tree is subject to decay. Inonotus and Coltricia shelf mushroom can grow on the forest floor. The specimen in the picture partialy resembles both. Unsure of ID. 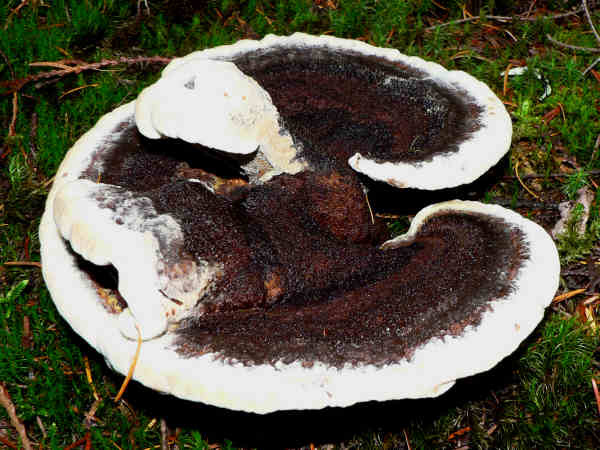 Tinder Polypores are shelf mushrooms that get their nickname from their utility. They are good for tinder. They are usually dull colors and hoof shaped. As the grow older they gain more rings. These mushrooms are common in wood around the entire northern hemisphere and beyond. 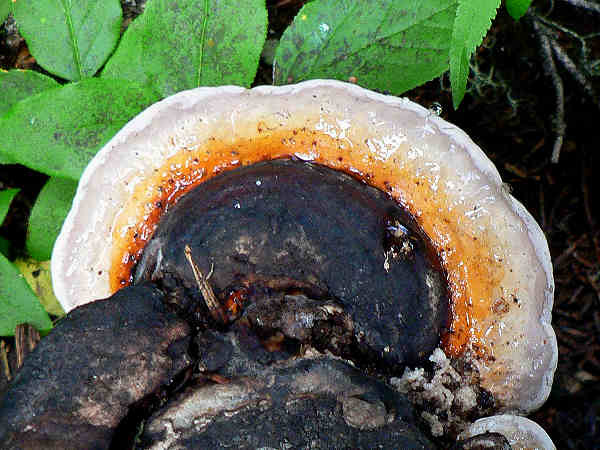 The name Ganoderma in mushroom circles often brings to mind reishi, the types of polypores prized as herbal medicines. By way of introduction, checking with your personal physician is always the best course of action when deciding on the use of any herbal supplement. 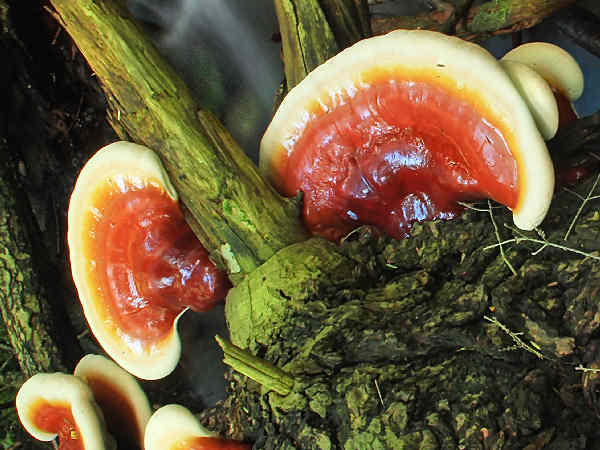 In the mushroom world, many different types of ganoderma species have been identified around the world. They tend to be generalists and can be found growing on the bark or roots of a variety of hardwood and softwood trees. Two of the more common species are presented. The first picture shows a Hemlock Varnish Shelf, very common on Eastern Hemlock trees. Identifying them is straightforward. The top of the mushroom has a shiny varnish looking appearance. They can pop up in bunches on a tree, and then the wood decomposition process begins. 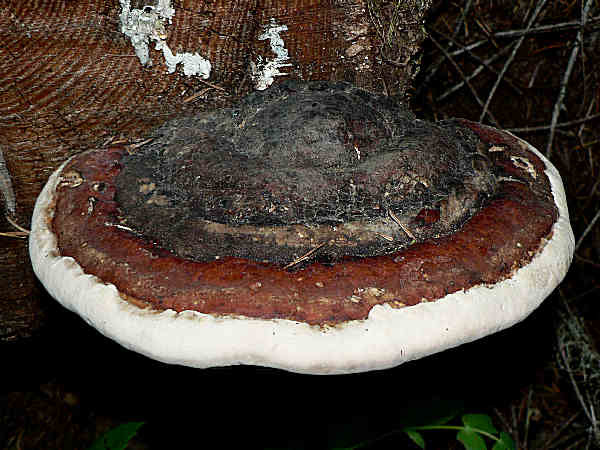 Artist’s Conks (Ganoderma applanatum) grow in layers from season to season, sometimes reaching growth of two feet across. Additionally, they produce massive amounts of spores during their development, with large ones capable of dispersing billions in a single day during their summer and fall growing season. Color variations are typical across their range, however, most closely resemble the one in the picture, brown on the top and white on the bottom. Unfortunately for the host tree in the picture, the species helps decay wood. 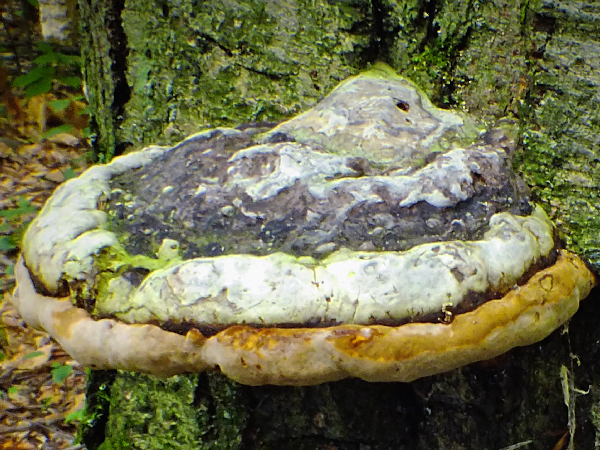 The attached Artist’s Conk is slowly eating away the base of the trunk. Many folk art masterpieces have been etched on specimens by patient and creative artists.